UPTON, NY–A study at the U.S. Department of Energy's Brookhaven National Laboratory identifies new details of how a sugar-signaling molecule helps regulate oil production in plant cells. As described in a paper appearing in the journal The Plant Cell, the work could point to new ways to engineer plants to produce substantial amounts of oil for use as biofuels or in the production of other oil-based products. The study builds on previous research led by Brookhaven Lab biochemist John Shanklin that established clear links between a protein complex that senses sugar levels in plant cells (specifically a subunit called KIN10) and another protein that serves as the "on switch" for oil production (WRINKLED1). Using this knowledge, Shanklin's team recently demonstrated that they could use combinations of genetic variants that increase sugar accumulation in plant leaves to drive up oil production. The new work provides a more detailed understanding of the link between sugar signaling and oil production, identifying precisely which molecules regulate the balance and how. "If you were a cell, you'd want to know if you should be making new compounds or breaking existing ones down," said Shanklin. "Making oil is demanding; you want to make it when you have lots of energy–which in cells is measured by the amount of sugar available. By understanding how the availability of sugar drives oil production, we hope to find ways to get plants to boost the priority of making oil." The team's earlier research revealed some key biochemical details of the sugar-oil balancing act. Specifically, they found that when sugar levels are low, the KIN10 portion of the sugar-sensing complex shuts off oil production by triggering degradation of the oil "on" switch (WRINKLED1). High sugar levels somehow prevented this degradation, leaving the on-switch protein stabilized to crank out oil. But the scientists didn't understand exactly how. "You label the molecules with a fluorescent dye and measure how they move away from a heat source," Shanklin explained. "Then, if you add another molecule that binds to the labeled molecule, it changes the rate at which the labeled molecule moves away from the heat." 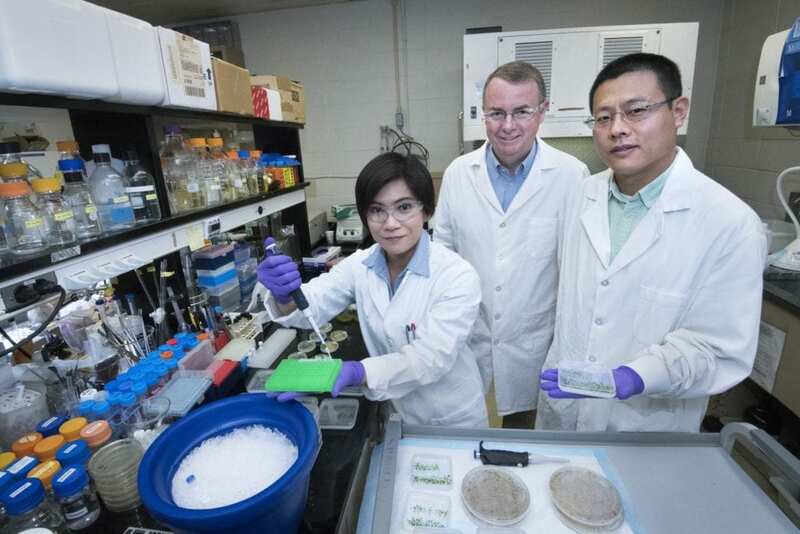 "Jan and Zhiyang's rapid application of this novel technique to this tough research problem was key to solving it," Shanklin said. Among the substances included in the study was a molecule known as trehalose 6-phosphate (T6P), the levels of which rise and fall with those of sugar. The study revealed that T6P interacts directly with the KIN10 component of the sugar-sensing complex. And it showed how that binding interferes with KIN10's ability to shut off oil biosynthesis. "By measuring the interactions among many different molecules, we determined that the sugar-signaling molecule, T6P, binds with KIN10 and interferes with its interaction with a previously unidentified intermediate in this process, known as GRIK1, which is needed for KIN10 to tag WRINKLED1 for destruction. This explains how the signal affects the chain of events and leads to increased oil production," Shanklin said. "It's not just sugar but the signaling molecule that rises and falls with sugar that inhibits the oil shut-off mechanism." To put this knowledge into action to increase oil production, the scientists will need even more details. So, the next step will be to get a close-up look at the interaction of T6P with its target protein, KIN10, at Brookhaven's National Synchrotron Light Source II (NSLS-II). This DOE Office of Science user facility produces extremely bright x-rays, which the team will use to reveal exactly how the interacting molecules fit together. "With NSLS-II at Brookhaven Lab, we are in the perfect place to bring this research to the next stage," Shanklin said. "There are unique tools available at the Light Source that will allow us to add atomic-level details to the interactions that we discovered." And those details could point to ways to change the sequence of KIN10, T6P's target protein, to mimic the effects of the interaction and modify the cell's regulatory circuitry to prioritize the production of oil. Brookhaven National Laboratory is supported by the Office of Science of the U.S. Department of Energy. The Office of Science is the single largest supporter of basic research in the physical sciences in the United States, and is working to address some of the most pressing challenges of our time. For more information, please visit science.energy.gov [https://science.energy.gov/]. Scientific paper: "Trehalose 6-phosphate positively regulates fatty acid synthesis by stabilizing WRINKLED1"